AP 8th/ 9th Class SA1 Summative 1 Physical Science (PS) Objective Type Model Papers Prepared by Nagamurthy Sir and Guruprasad Sir for 8th 9th Class Physics (PS) Subject OMR Sheet Download pdf. 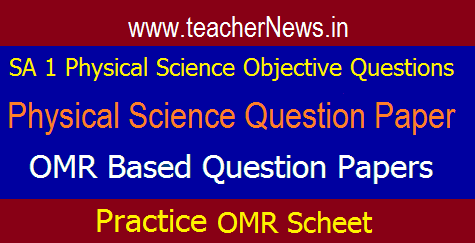 Physical Science OMR based SA1 Summative 1 Objective ( Bits/ Multiple Choice) Question Papers for Andhra Pradesh, Summative 1 - 8th Class, 9th Class Paper wise Model Papers for Physical Science subject. Download AP SA1 PS Objective Model Papers for Physics Subject 8th Class pdf. AP SCERT released 8th 9th classes object type OMR Based Question papers for all subjects CCE Method Academic Standards for Objective Type (Mode) Question Papers of Physical Science. AP SA1 OMR based objective papers. As you are all aware AP SA1 exams will be held from 15/12/2017 on OMR sheets, So we here train you how to Write OMR sheet answers for SA1 Exams. AP SA1 9th Class (IX Class) Physical Science Subject Telugu Medium(TM/T.M), Physics English Medium (EM/E.M) Model Question Papers in Objective Type, AP SA1 PS Blue Print, Physical Science Objective Type Question Paper Pattern For 8th,9th Class Objective Type Question Paper for 8th,9th class in AP State. AP SA 1 Physical Science Blue Print, 8th Class Physics Objective Type Question Paper Pattern For 8th, 9th Class Students in Andhra Pradesh State. Physical Science SA1 Objective Type Model Papers for 8th 9th Classes Download Hindi SA1 Objective Type Model Papers for 8th 9th Classes Download English SA1 Objective Type Model Papers for 8th 9th Classes Download Maths SA1 Objective Type Model Papers for 8th 9th Classes Download Physical Science (PS) SA1 Objective Type Model Papers for 8th 9th Classes for 8th 9th Classes Download Telugu SA1 Objective Type Model Papers for 8th 9th Classes Download Social SA1 Objective Type Model Papers for 8th 9th Classes. Andhra Pradesh High School SA 1 Summative 1 SA 1 Physical Science objective type Model Question papers for 8th 9th Classes PS Subject Question Papers Download. AP SA1 Physical Science Objective Type Question Papers for 8th, 9th Classes APSCERT Summative Assessment 1 (SA 1) Objective Model Question Papers CCE for 8th, 9th Classes PS Summative 1 SA1 Model Question Papers for 8th, 9th Classes Physical Science objective Question paper Download APSCERT SA1 Objective Question Papers Physics Subject Wise 8th Class SA 1 Question Papers Download here. Summative 1 SA 1 Physical Science Objective Question Paper, Download 8th Class PS SA 1 Question Paper 2017, Download 9th Class Paper Summative / SA-1 Physical Science Model Paper, Download 8th 9th SA1 Physical Science Objective Model Question Papers, 6th to 10th Classes, Download AP Summative 1 Physical Science Question Papers, SA1 Physics Model Papers CCE Summative Assessment 1 / SA 1 PS Model Papers, 8th Download SA 1 Physical Science Multiple Model Question Papers For Classes 10th Download, Summative Assessment 1 SA 1 P. Science Question Papers, Class VI To X SA 1 Phy. Science 9th Class Model Paper, Download SA1 Physical Science Answer Key Sheet 2017, SA1 Physics Answer Key Sheet 2017, 8th SA1 Physical Science Model Paper For 10th Class, Download SA1 Physical Science Model Papers, Summative Assessment 1 SA 1 PS 8th Class Question Papers Download. Physical Science SA 1 Objective Model Question Papers for 8th, 9th Classes Summative 1 PS Objective Type OMR Based Question Papers with Bits/ Multiple Choice Download.